KNOW THE BEAUTY OF THE SACRED VALLEY! BOOK NOW! The Sacred Valley of the Incas is an immense area full of fertile land where the Incas built temples and citadels. At the moment it includes diverse Cusco towns like Pisac, Chinchero, Urubamba and Ollantaytambo. There are still the main Inca sites such as the archaeological site of Pisac, Ollantaytambo, Chinchero and more. Guide service in Spanish or English. Pick up from the visitor from the door of your hotel. Fast payment by credit or debit card. Buffet lunch service in Urubamba. Tourist Ticket of Cusco: entrance to Pisac, Ollantaytambo and Chinchero. 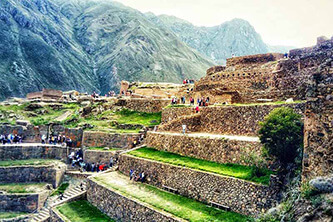 The tours to the Sacred Valley of the Incas of 1 day start at the archaeological site of Pisac. They also visit the archaeological complexes of Ollantaytambo and Chinchero. The Full Day All Included Service offers transportation, buffet service, tickets and everything necessary for a pleasant and safe visit. The All Included Service offers a comfortable and well-organized trip. The visitor only needs to enjoy the trip to the Sacred Valley: tourist ticket of Cusco, transport, buffet lunch, tourist guide and more. The tourist starts his journey from the door of his hotel. A modern minivan will wait for you to begin the tour of the Sacred Valley. The transport service lasts all the way through the Sacred Valley. The transport allows a maximum of 20 passengers. The buffet lunch includes dishes made with Peruvian products. It takes place in the town of Urubamba. The tour guide will accompany you throughout the tour of the Sacred Valley. The service includes guidance in English or Spanish. The tour does include the Tourist Ticket of Cusco: income to Pisac, Ollantaytambo and Chinchero. 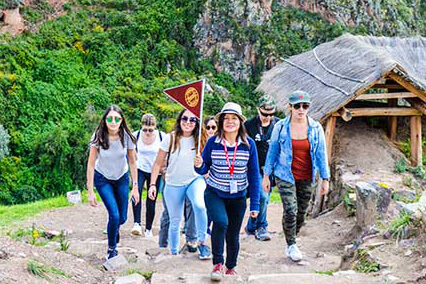 The trip to the Sacred Valley of the Incas with the All Included Service offers constant assistance before and during the tour. The Tourist Ticket of Cusco (tickets) is included so the visitor avoids queuing. The trip is organized in detail by an authorized and experienced tourism agency. The All Included Service is organized by Machu Picchu Terra, tourism agency authorized by the Ministry of Culture of Peru (code MA0473). Do you have doubts about the Sacred Valley tour? You can contact the agents of the All Included Service. The phones are at your disposal before and during the tour: 084 - 403077. You can cancel a purchased tour if you do so ahead of time. The return of money includes a penalty. Unlike other tours, with the All Included Service you do not need to buy the Cusco Tourist Ticket to enter the archaeological sites. These are already included in the tour. The All Included Service is organized by experts in the tourism sector. You can travel with total security and organization. Where is the Sacred Valley of the Incas? The Sacred Valley of the Incas comprises an immense area of ​​fertile land. Among the main towns included in its territory are: Pisac, Chinchero, Urubamba and Ollantaytambo. Only 30 kilometers from Cusco you can visit the Sacred Valley. The prices of the Full Day All Included Service to the Sacred Valley of the Incas already include the Tourist Ticket of Cusco. Tourists do not need to queue to acquire this service. WHAT WILL YOU SEE IN THE SACRED VALLEY? The Sacred Valley offers a variety of tourist attractions such as the archaeological sites of Pisac, Ollantaytambo and Chinchero. 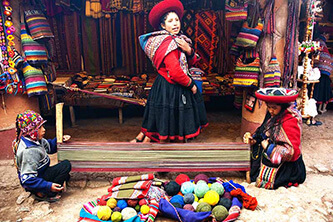 In addition, the town of Urubamba, the handicraft market of Pisac and a textile center in Chinchero will be known. 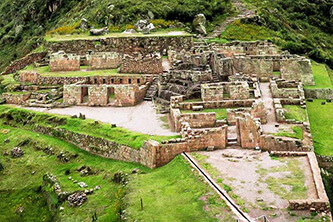 This archaeological center is known as the 'Mirador del Valle Sagrado'. It is located on top of the town of the same name. Pisac artisan market attends every day. On Sundays, the market brings more merchants. It is the most traditional in Peru. Urubamba is the largest town in the Sacred Valley. It has several tourist attractions. There you will rest a moment to enjoy the buffet lunch. In the fortress of Ollantaytambo survive temples, enclosures and various Inca buildings with great similarity to Machu Picchu. The archaeological site of Chinchero was the palace of the Inca Túpac Yupanqui. Its walls have terraces, temples and impressive landscapes. The textile center of Chinchero transmits the ancestral techniques of spinning garments based on alpacas. The trip to the Sacred Valley starts at the door of your hotel. Then the trip to the archaeological site of Pisac. 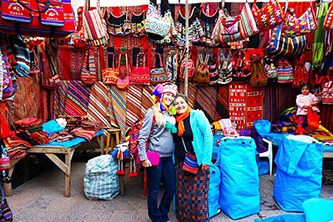 Before leaving for Urubamba to enjoy a buffet lunch, you will visit the artisan market. The next stop is in Ollantaytambo. 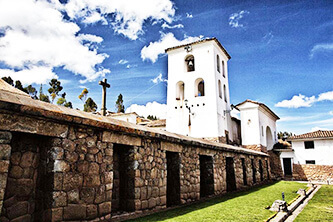 Visitors will tour the fortress of the place and then go to Chinchero. There you will visit the Tupac Yupanqui palace and a traditional textile center before returning to the city of Cusco. We start the tour at 8 am At that time, our transport will pick you up from the door of your hotel to go to the town of Pisac, just outside the city of Cusco. 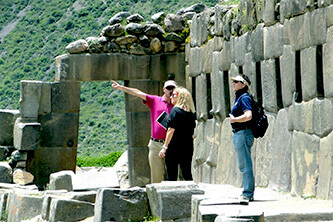 In Pisac we will visit, in the company of our tour guide, the archaeological site of Pisac . Then we will visit its famous artisan market, the most emblematic of the region. Then we will go to Urubamba where we will enjoy a delicious buffet lunch made with Peruvian products. After a short rest, we will continue the journey to the famous town of Ollantaytambo. The only one in Peru that conserves its urban organization since the Inca times. 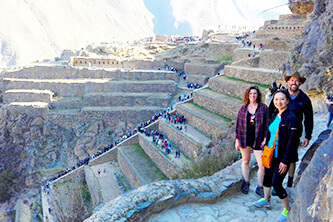 In the company of our tour guide we will visit the famous Inca sites of the archaeological site of Ollantaytambo . Then we will have time to visit this famous town. On our way back we will visit the traditional town of Chinchero . There we will visit the ruins where the palace of the Inca Tupac Yupanqui was. Then we will visit a textile center where we will learn to make clothes in a traditional way. Finally, we will return to Cusco at dusk. The point of arrival is near the Plaza de Armas of the city. Private services will leave you at the door of your hotel. The private service is designed for tourists traveling in a group (family or friends). Allows you to visit the Sacred Valley from 2 tourists to more. Being a smaller group, the tour guide service is more personal. In addition, the times are flexible. Includes pick up and return to the tourist hotel. The visitor starts the tour with the pick up from the door of his hotel. In the return, the tour ends in the same place. The tour to the Sacred Valley of the Incas is made with a maximum group of 20 tourists. In a private group, on the other hand, it is with a small group (6 visitors). The tour guide is only for the private group. So the tour is personal. The tour to the Sacred Valley in private service is more dynamic. Thus, there is more free time for tourists to enjoy their visit better. The private service to the Sacred Valley of the Incas is optional. To request it you must send an email to info@boletomachupicchu.com. HOW IS THE CLIMATE IN OLLANTAYTAMBO? Most of the towns that make up the Sacred Valley of the Incas have a pleasant climate. The temperature varies from 4ºC. at 23ºC. The dry season runs from April to October. From November to March, the rainy season. What to take to the trip to the Sacred Valley? The Sacred Valley of the Incas generally has a hot climate. It is recommended to bring: hat, cotton clothes, sunscreen, mosquito repellent, water, extra money and poncho in case of rain. Still have doubts? Learn about the frequent questions asked by visitors who choose the tour. If you still have any questions, you can contact us at info@boletomachupicchu.com. 1) Are the schedules fixed? The schedules are flexible to the taste of the visitor. If the tourist likes, he can spend more or less time in the different tourist attractions. The coordination is directly with the tour guide. 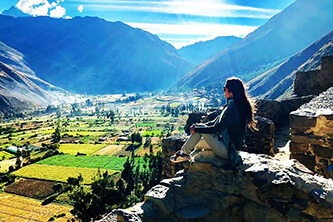 4) Where does the 1-day tour to the Sacred Valley begin and end? The tour to the Sacred Valley of 1 day begins with the pick up of the tourist from the door of his hotel. The tour ends with the return to Plaza San Francisco, a few blocks from the Plaza de Armas of Cusco. The 'Private' service ends at the door of the visitor's hotel. 2) How to pay for the All Included Service? To make the payment of the tour you must complete the information required in our 'reservation form'. Then you must pay by credit or debit card (at least 60% of the value of the tour). The rest can be canceled in the city of Cusco before the tour. 5) How to book a tourist guide in another language? The tour includes a tourist guide service in English or Spanish. If you want a guide in another language, you must send an email requesting a private guide in the language of your choice. 3) How many people are there in a shared and private service tour? The shared service tour allows a minimum of 7 and a maximum of 20 tourists per group. 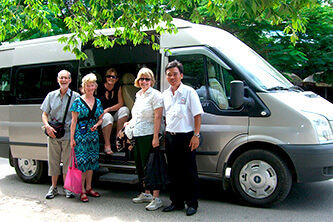 The private tour allows a maximum of 6 tourists per group. KNOW THE BEAUTY OF THE SACRED VALLEY! RESERVE NOW!